The semi-state could also look at relocating more of its operations from a number of sites. AN POST HAS begun exploring options to redevelop a number of its properties with “significant vacant space” for non-postal commercial use – and possibly relocate more of its operations. 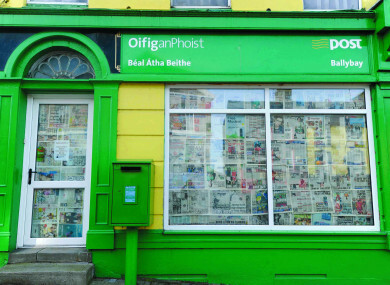 Last week, the postal service announced a decision to shutter 159 rural post offices across 25 counties following on from news that the semi-state may move staff out if its ‘dilapidated’ offices in Dublin’s GPO building. In a recent tender, An Post sought the services of architectural specialists to undertake feasibility studies for the redevelopment of 180 properties in its existing portfolio. A spokesman for An Post told Fora that none of the units due to be closed are included in the portfolio of 180 properties in line for potential redevelopment or relocation. The tender said that the post company has an “extensive property portfolio” that is comprised of mail centres, local delivery offices, company post offices and admin offices. Post offices traditionally featured both a retail section and a so-called ‘delivery service unit’, for processing mail. However, in recent years An Post has relocated many of these functions to centralised mail centres, the tender said. The semi-state is also considering using some of the excess space to expand existing retail facilities, while the relocation of operations from the 180 facilities was also being explored. “Relocation of an existing facility may also be considered in which case the appointed architects will be required to carry out feasibility studies to assess whether these alternative premises may be suitable for An Post’s needs,” the document said. An Post’s spokesman said that the 180 properties mentioned in the tender include post offices, mail centres and admin offices and that it was a “standard requirement” for An Post to seek such architectural services. The tender noted that applicants must have a proven track record in the commercial property sector and overseeing alterations, extensions and refitting to office premises. An Post’s plan to redevelop the selection of its underutilised properties comes amid controversy around its decision to dramatically reduce its rural post office network. The company noted that 16 of the affected post offices have already closed and that its 960 remaining outlets will receive an “investment package aimed at improving services for customers”. The move has been criticised as an “attack on rural Ireland” by one MEP. However An Post chief executive David McRedmond told RTÉ’s Morning Ireland that services from the closed units would be consolidated in the nearest available post offices and this would help those outlets offer better services. Last year, An Post registered a significant rise in profits after it hiked the price of a stamp from 72c to €1. Email “An Post might turn its 'surplus' property into commercial space”. Feedback on “An Post might turn its 'surplus' property into commercial space”.